We recently got our first Blu-Ray player and I have been really impressed with the picture quality of Blu-ray movies. I was thrilled to learn that in honor of the classic holiday special “Santa Claus is Comin’ to Town” turning 40 years old, Classic Media has released the ultimate gift boxed set on Blu-Ray-The Original Christmas Classics. First of all, it is hard for me to believe that one of my childhood holiday favorites is actually celebrating its 40th anniversary and I am now sharing the beloved annual viewing tradition with my own three children and husband each year. 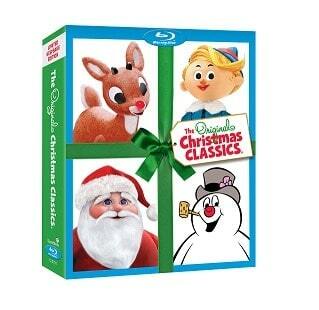 The Original Christmas Classics Blu-Ray Gift Box Set includes four classic holiday tales, Frosty the Snowman, Frosty Returns, Rudolph the Red Nosed Reindeer and Santa Claus is Comin’ to Town. Every year my entire family sits bundled up together on the sofa drinking hot cocoa, cuddling and watching our favorite classics. What a great idea to have this set of four classic holiday shows as an attractively packaged Blu-Ray boxed gift set. My husband and I couldn’t stop commenting on the superior picture quality of The Original Christmas Classics on Blu-ray and I don’t think I have ever seen these classics presented so vividly and clear. My family enjoyed our annual tradition in a new way this year and it was amazing! What a fantastic gift idea or may I suggest that you pick up The Original Christmas Classics Blu-Ray Gift Set for your own family to enjoy this year. We have these movies, and my kiddos LOVE them. I think we bought them 2 years ago, and I know they will always be favorites around Christmas time! They must be beautiful in Blue Ray!